Top row (left to right): 1. Loren Fong, 2. Joan Stammer, 3. Kenneth Oftedal, 4. Leigh Gilson, 5. Eric Jellinghausen, 6. Theresa Hutchens, 7. Kathryn Honour, 8. Mark Tewes, 9. Suzie Henry. Second row: 1. Jean Johnson, 2. Doug Ross, 3. Jody Dobson, 4. Don Black, 5. Wendy Badger, 6. Kenneth Morrison, 7. Ann Fowler, 8. Kirk Knox, 9. Laura Holland. Third row: 1. Scott Williford, 2. Cheryl Hargreaves, 3. David Loyd, 4. Kathy Shaw, 5. David Booth, 6. Anna Gadd, 7. Bruce Boer, 8. Carol Gay Anderson, 9. Jerry Wilson. Fourth row: 1. Mr Kashiwamura, 2. Leslie Harrison, 3. Robin Wright, 4. Laura Phair, 5. no picture, 6. Peter Kavanaugh, 7. Kirsten Wood, 8. Karen Morrow, 9. Mr Donald Larsen. Credits: From the collection of Kathryn (Honour) Stewart. 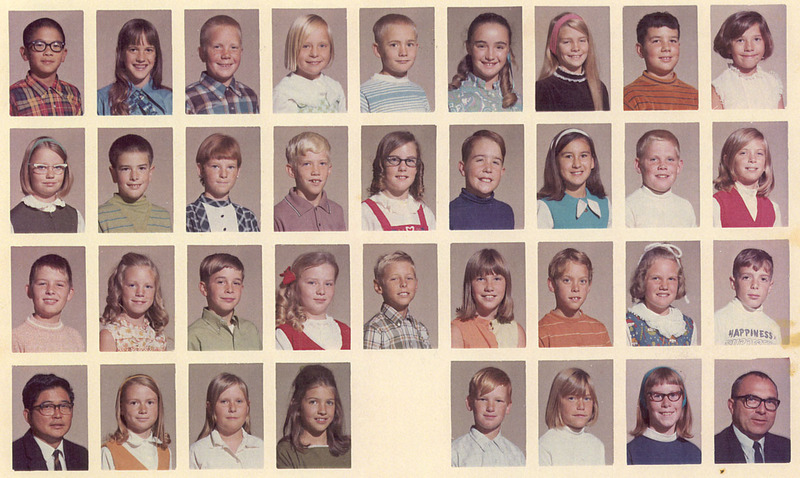 Thanks to Mark Clarin and Joan (Stammer) Ambrose for helping to identify the kids in this picture.